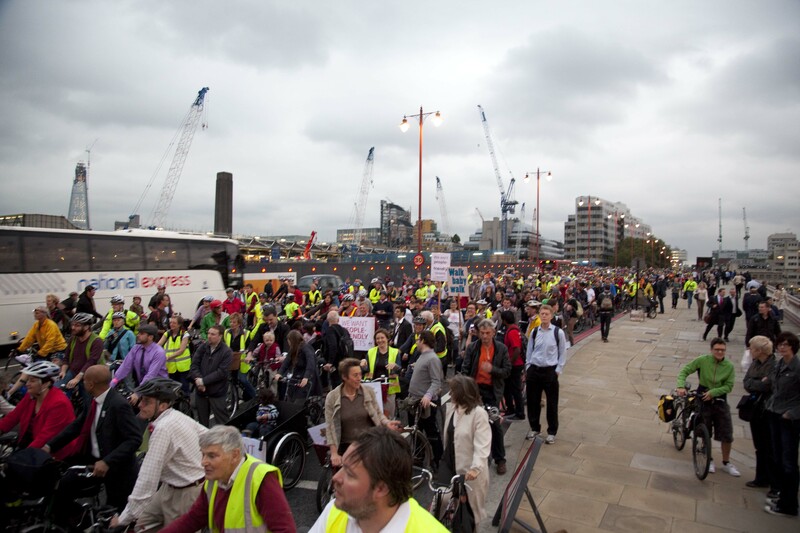 An estimated 2,000 cyclists came out for the third flashride against Transport for London’s controversial planned changes to the thoroughfare’s road layout on Wednesday evening. As the sun started to set over Blackfriars Bridge, riders on all manner of cycle came to the meeting point on Upper Ground, by Doggetts Pub. 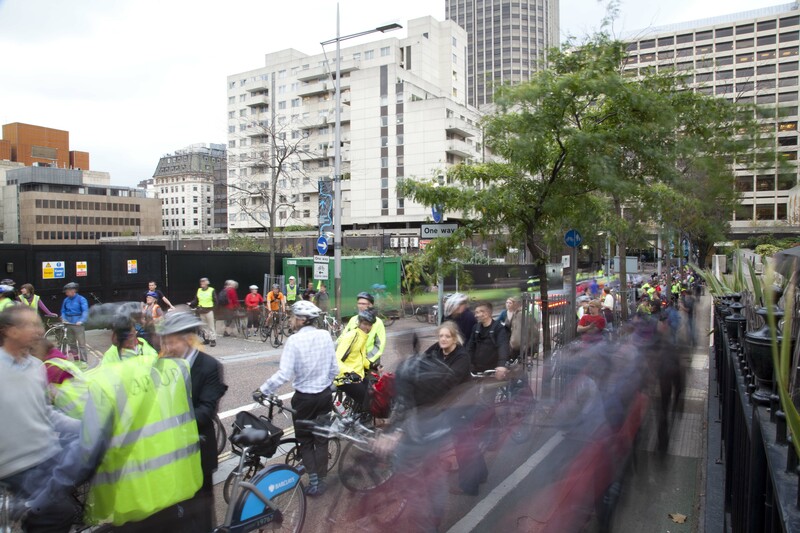 Everyone from suits to scenesters were united by London Cycling Campaign’s third Flashride in their ongoing “Battle for Blackfriars Bridge”, pursuing a new, safer design for the junction. The flashride follows smaller ones organised in May and July. 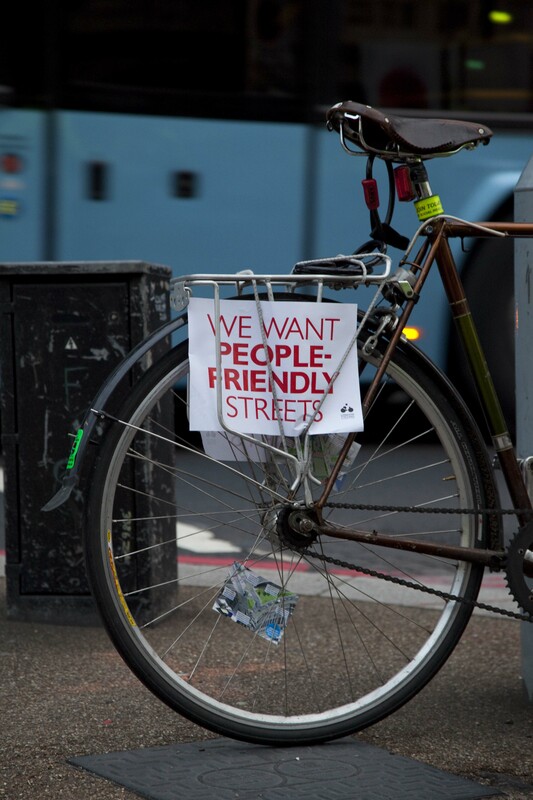 Pedestrians also took part: the crux of the issue is developing safe streets for all road users. increase the lanes on the busy thoroughfare from two to three. Several serious crashes have been reported on the bridge this year. Politicians from all major groups have noted the danger of the current road layout, and Mayor of London Boris Johnson has said more work needs to be done on the accessibility of cycling over the bridge. But nothing has been changed. safer, estimated to add only 1% to the cost of the three-year development. Come 5.45pm, policemen in attendance stopped traffic to let cyclists pour onto the road, and the protest began. Quickly, the bridge became a heaving kaleidoscope of cyclists, stretching as far as the eye could see. The “battle for Blackfriars Bridge” is belligerent in name only: this was another peaceful and good-natured protest, crossing at walking pace from the south to north side of the river, and back again, circling the conspicuous diggers continuing development work. London Assembly members Jenny Jones (Green), Caroline Pidgeon (Liberal Democrat) and Val Shawcross (Labour) took part, alongside London Mayoral candidate Brian Paddick. However, there was one heated altercation as a moped driver attempted to scythe right through the protest. Several cyclists remonstrated with him, almost resulting in a fight. The battle for Blackfriars Bridge is just the starting point for London Cycling Campaign’s next big initiative. Their ‘Go Dutch’ project, to be launched in the New Year, aims to make London’s major roads safer for cyclists. 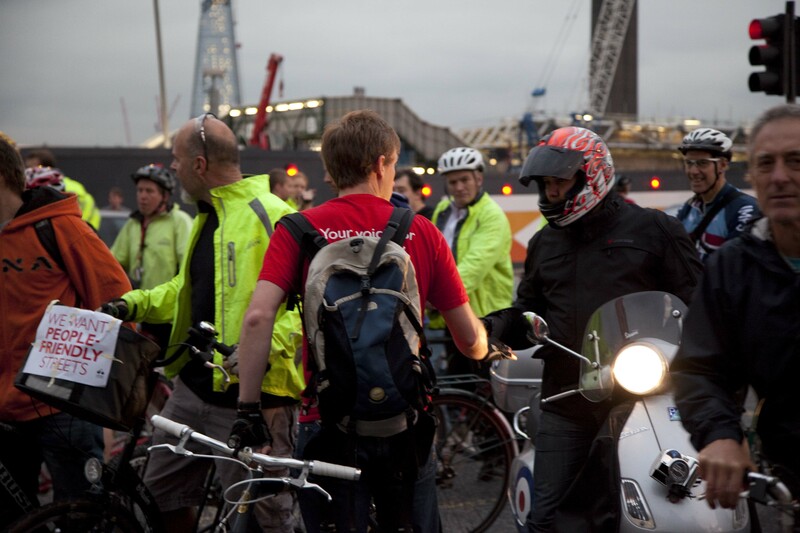 See the forthcoming October 20 edition of Cycling Weekly for more coverage of the Blackfriars Bridge flashride.